Friday saw me head out to Expedition National Park. This park is fairly remote, 90km along a dusty road from the small town of Taroom. 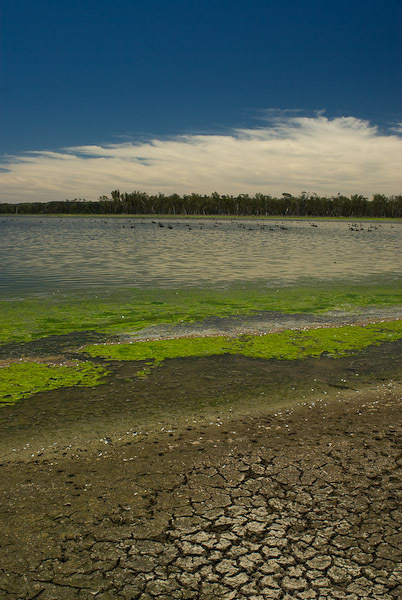 Not far along the route I stopped at Lake Murphy - a waterbody which forms in wet periods when the nearby Robinson Creek breaks its banks, creating a haven for waterbirds. There was plenty of water, and big mobs of black swans as well as ibis, stilts, cormorants and no doubt many others. The lake was christened by Leichardt when he camped beside it on his expedition north. It was very hot; dry heat. The vegetation I passed as I drove was quite peculiar; savanah-like, with abundant Livistonia palms and Ironbarks. Starkvale campsite, where I stayed, was very pleasant. There had obviously been a big blow in the area not long ago - fresh fallen branches littered the ground. It was too hot for much walking so I headed out to take a look at the 'cattle dip' which is a permanent waterhole in a section of Robinson gorge. This gorge winds through the park, carved out of the sandstone by Robinson Creek. Whilst above, on the plateau, dry eucalypt forest dominates, the relatively moist gorge shelters palms, figs and other rainforest scrub species. Despite its muddy waters, the cattle dip looked inviting, but finding a way down looked a bit too risky, considering the remoteness of the park. 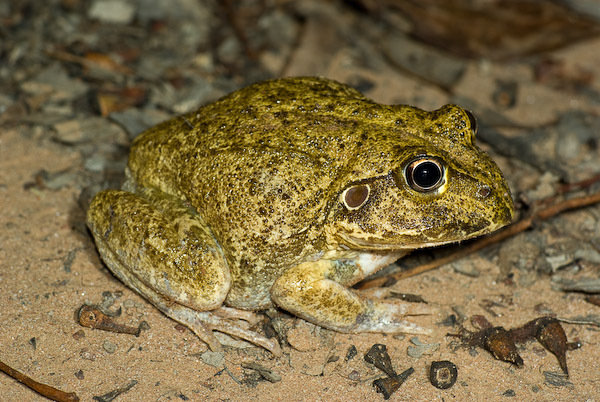 That night frogging around the campsite I saw another new species for me, the New Holland water-holding frog, Cyclorana novaehollandii as well as plenty of Green Treefrogs (Litoria caerulea) and Ornate Burrowing Frogs, Opisthodon ornatus. A couple of geckos were around, including a 'Zigzag' Velvet gecko, Oedura rhombifer. Cool name. 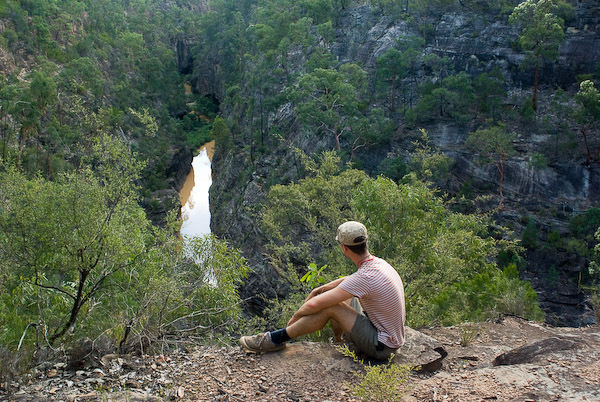 Before leaving the park, I set off early on the walk to Robinson Gorge Lookout. A big tree had blown down at the lookout and several more had toppled down into the gorge. There were great views of the 100m sandstone walls. From the lookout there's a more-or-less unmarked trail down to the gorge floor. No water was flowing, but the occasional muddy pool combined with the shade and trees made for a very pleasant, cool environment and I spent an hour or two just exploring down there and soaking up the ambience. At one point, while I sat, beautiful Carlia skinks with orange flanks and blue heads came out and foraged on the rocks and ground around me. A couple of disappointing notes - firstly the cattle tracks through the gorge, secondly the numbers of cane toad tadpoles in the pools and little toadlets hopping around everywhere. As the sun climbed, even in the gorge the temperature began to rise and I was chugging down my water. It was time to head back to the car, have a bite of lunch and hit the road, perhaps to somewhere cooler.